You've built up significant assets, knowledge and skills, but how and when do you pass these on? This is not just an issue for retiring farmers, as illness or death can strike at any time. Is your business ready to transition? Succession planning is the process by which farm assets, knowledge and skills transfer to the next generation. Do you want to be the driver of your business future or the passenger along for the ride? Start your succession plan now by beginning the conversations and setting your business up for a planned future that will leave a legacy for future generations. What does a successful succession plan look like? It's an inclusive plan that outlines the process for the transfer of both the financial and knowledge of the business, is deemed fair to everyone, is well communicated, agreed upon, understood and is monitored and reviewed. There are many ways to approach the subject and there is no off-the-shelf guide to follow. A succession plan must meet the needs of all involved parties and be economic for both the retiring and farming generations. The starting point is having conversations. Conversations about the future, what the business ambitions are, your expectations and your business partners, and addressing any ‘icebergs’ or below the surface tensions which could impact on the business transfer process now or down the track. Integrate succession planning thinking and conversations into your business sooner rather than later. Succession discussions should happen on a regular basis within the business and if required with a succession specialist. Succession planning can be a difficult topic because of emotional connections to both the farm and/or the succeeding farmers. This can cause fear and procrastination. Consider starting sooner rather than later and developing a big picture plan. Undertake due diligence, gain clarity on expectations, get support, determine what is equitable, and communicate often. Succession planning takes time, it's a process and not an immediate resolution. Develop a business plan and strategic plan and put these into action ensuring farm management practices achieve this plan. Revisit the plans often and consider progress made and changes needing to occur to ensure you are still on track to achieving the business vision. Do you have clarity on the values and goals of all parties involved and how do you bring these together to achieve a win-win? Is the business profitable and sustainable? If not, can it become profitable with a change in management or more investment? What is the availability of capital, cashflow or bank finance? Is it worth developing a succession plan or are the financial constraints too restricting? Do you have the right operating structure to help you move forward? How long do the current operators want to continue operating the farm business, and what level of input do they want to have on an ongoing basis? What do the current farm owners want at the time of succession? Consider lifestyle, income, housing, continued involvement with governance of farm etc. Have they created a retirement plan? Are the ‘chosen successors’ interested in taking over? Do they have the same vision and values and what are their needs going forward? Are they equipped to take over the business with skills and confidence? Including the skills and attributes required of the successor. What do these look like now and how will this change as you transition? Differentiate between ownership and control and the level of input of each party. Be clear on who the decision maker is and where responsibility lies. Research and ask questions, read, attend seminars, discuss with farming friends their experience and lessons learnt. This could be an independent facilitator to assist in mediating succession planning meetings or the use of client-focused accountant, farm advisor, lawyer and/or bank manager. Your professional team could be formed into an advisory group to add advice to your succession planning process. Often facilitators will follow a process whereby they interview/question the parents, siblings and siblings' partners separately to uncover their values, needs, wants, expectations and business vision individually before they bring this together and start to form a mutually beneficial plan. Write down succession plans and goals including both the personal and business goals of all involved. Ask the where, why, what, when and how questions. What is considered fair and equal will differ with every situation. Communication and openness and even some compromise will be needed. Discussing this especially if there are non-farm family members involved. Even modest assets should have a will. If you do not have a current will, your assets may not pass to who you intended or could end up with the state. Update your will on marriage, separation, having children or changing business structure. Throughout the year revisit the plan, build on where you have gotten to and to involve all parties. This is not a do once and never revisit activity. Communicate in a way which allows everyone to be heard. Effective communication, having the opportunity to contribute and listening must be at the heart of any plan. Unless there is strong understanding of everyone’s thoughts, needs and vision, the plan and decisions will be made on assumptions – assumptions lead to misunderstanding and misunderstandings lead to conflict. Setting up structured meetings at set times through the year that follow a set agenda and have contributions from all those involved, including the farm advisory team could be useful. Take time to identify the skills and behaviours needed to ensure a successful future and select a person/people who matches these needs; or develop a training plan so they can acquire the skills. Make sure all legal documents are up to date, appropriate for the family and business and in one accessible place. Fully understand the business structures in place and question if these will fit future needs. 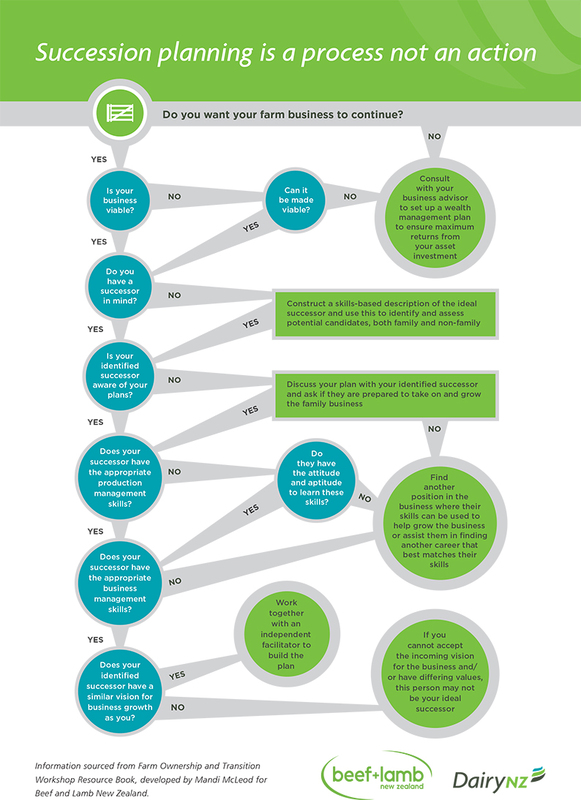 How well are you facing the future of your family business? Take a few minutes to complete the succession planning self-assesments and determine your next steps. Are you ready? What are your next steps?